Yep…it’s Acorny Thank You AGAIN!!! I’m just LOVIN’ this set and in these colors. COOL!!! Anyway…since it is Tuesday it is time for another SUO challenge – Punch It Up…using punches on your card. Well…since I’m LOVIN’ this punch I knew I was going to use it then I also used the Banner Triple Punch and the Bow Builder Punch. I actually had done another card for this challenge then realized the only punch I used was the acorn one so I decided to ‘punch it up’ a little more and did a second card! Delightful Dijon – 3 1/2 x 5 1/2, ink the Woodland Embossing Folder using Delightful Dijon, run the cardstock through the folder. Timeless Elegance (bold black/vanilla stripe) – 5/8 x 5 1/2, add to back of panel and add to card front using dimensionals. Very Vanilla – 2 x 3 3/4, punch using Banner Triangle punch, stamp greeting using Versamark and black emboss. 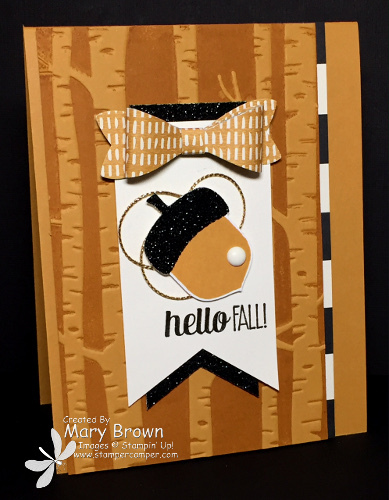 Stamp solid acorn using Delightful Dijon, punch out, punch out acorn top from Black Glimmer, layer, add adhesive to the back and then add loops of Gold Cording Trim. Add using dimensionals. Add Vanilla Enamel Dot. Boho dsp – Punch out Bow Builder using Bow Builder Punch. NOTE: I punched out double and layered so inside of the bow was same as outside. Add using glue dots. This entry was posted in Holiday Mini, SUO Challenge and tagged Acorny Thank You, For All Things. Bookmark the permalink.